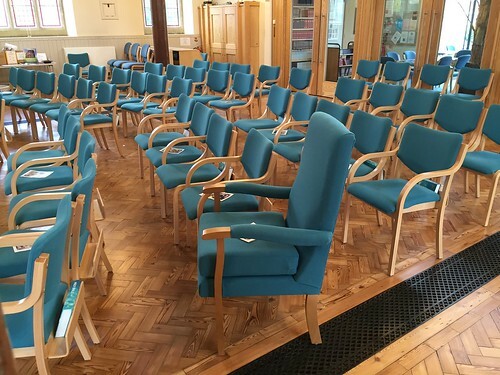 The Drive Methodist Church in Sevenoaks (between Christmas 2015 and Easter 2016) undertook major upgrading. This included removal of pews and their replacement with new chairs. 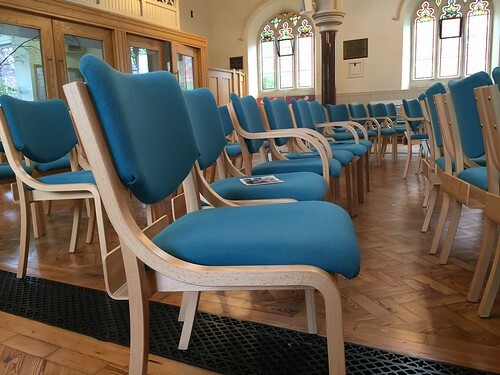 I was secretary of the “Sanctuary Project Group” (SPG) and was personally responsible for the design and colour of the new church chairs, a somewhat contentious issue between church members! After investigation I chose Alpha Furniture to supply the chairs. Our choice was in no small part due to meeting and dealing with Alpha representative Phil MacInnes who from the outset was pleasant, helpful, informative and very knowledgeable about all aspects of church chairs. He himself brought to our church a range of different chairs, chosen from the Alpha website, and left them for our members to try out. He then came to an open evening meeting in Sevenoaks, to contribute to a presentation made to church members. His calm authoritative manner, obvious wide knowledge and experience, and personal involvement in his own church’s life, helped to guide the meeting to reach agreement on the type of chair we should have. Other Alpha personnel were without exception excellent, and the order process, transport, and delivery were completed entirely to our satisfaction. The quality, comfort, and appearance of the chairs is excellent and even those members who opposed the removal of pews and pulpit are now content. I would strongly commend Alpha Furniture for the high quality of their service and integrity.